You will experience all sorts of Kauai activities in this action-packed day! Join Outfitters Kauai for Kayaking, Hiking, Ziplines, waterfalls, rope swings, a hayride across Kipu Ranch, and a ride on an exotic motorized canoe. The Zipline Safari Tour begins with a two mile kayak adventure on the peaceful Hule'ia River. After kayaking you will hike through Kauai's pristine tropical paradise. Next you will board Outfitters Kauai's unique wagon and see the sights of Kipu Ranch such as sights from Jurassic Park and Raiders of the Lost Ark. After the ride you will enjoy a delicious picnic lunch. The exciting Kauai ziplines are on the agenda after lunch! Zipline past the Haupu Mountains & trees on the 800' zipline. Traverse a rain forest valley on the suspension bridge. Walk through a hand carved tunnel by Kipu Ranch cowboys (paniolos) a century ago. 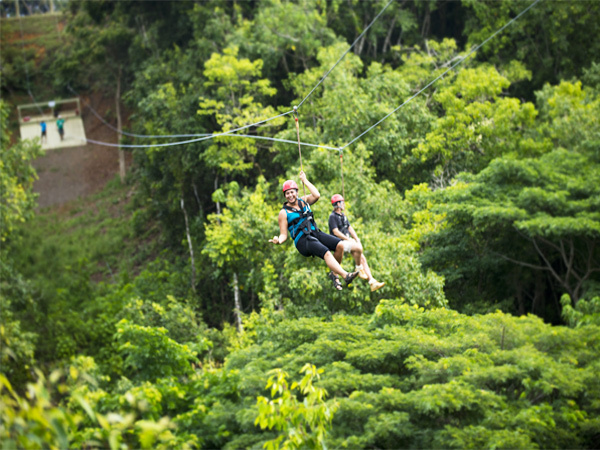 The 1800' tandem zipline allows you to share the zipline excitement with a buddy. Cool off at the wet and wild blue pool and experience the water zipline. Hold on to the T-bar, step off, zip over the water, let go and SPLASH into refreshing waters! After a short walk back to the riverside you can sit back and relax as Hawaiian style motorized canoes take you back. *Those not zipping will be taken by wagon to the hiking trailheads. Participants of these Hawaii activities must be able to walk 2 miles and kayak 60-90 minutes. For the zipline portion of the tour, you must be 7 years old. Please wear/bring: T-shirt, shorts, swimsuit, windbreaker or light rain coat, footwear with aggressive tread for muddy conditions (ex: sport-type sandals with heel straps or aqua socks with tread), hat, sunscreen, mosquito repellant and a waterproof camera. All of the above mentioned items can also be bought at the Outfitters Kauai shop in Poipu.